I am so happy to welcome Lucy Burdette to the blog today. 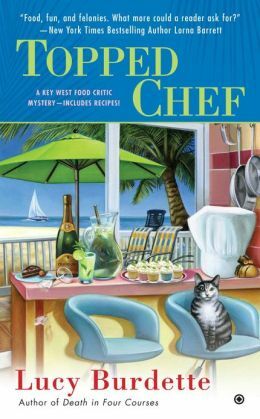 Lucy is the author of the Key West Food Critic mystery series and is an active member of the Jungle Red Writers blog. Please join us as we discuss her newest novel, the Hemingway cats, golf and more. BOLO Books: Murder with Ganache is the fourth outing for Hayley Snow. How has she changed over the course of these four books? Lucy Burdette: Love that question Kristopher! Hayley was head over heels with–how shall I say it?–a serious cad when she arrived in Key West in An Appetite for Murder. That relationship blew up pretty quickly, leaving her with no job, no income, and no home. It was not her finest hour and that showed in the decisions she made. Three books later in Murder with Ganache, she’s feeling much more confident and stable, and she’s able to care for her friends and family when they need her. This is my favorite part of writing–watching my characters grow and change as they grapple with the challenges in their life. BOLO Books: The Key West Food Critic novels align with a long tradition of culinary mysteries. If Hayley Snow was going to work with a fictional chef from this cozy sub-genre, who do you think she would choose to work with? Lucy Burdette: I’d have to say Goldy Koman, Diane Mott Davidson’s caterer sleuth. That series really kicked off this huge trend toward foodie mysteries. I loved Goldy’s family and friends and her recipes, of course. From my perspective as a clinical psychologist and a food lover, Davidson created a perfect stew of complicated family relationships and mystery and delicious recipes. I see Hayley as using food and cooking in much the same way: to connect with people, and to calm herself down, and to wangle information from suspects and witnesses. Goldy and Hayley would make a great team! BOLO Books: I completely agree with you Lucy. It seems to me that Goldy and Hayley would be both great friends and great colleagues. Each of the chapters in Murder with Ganache starts with a quote related to food. Some of those are from real culinary practitioners and some are from fellow authors in the field. Do you keep an on-going notebook filled with excerpts that you can use later? At what stage in the writing process do you add those quotes? Lucy Burdette: Another good question! In the beginning, I searched the Internet for quotes about food and begged friends to tell me their favorites. Now the more I read foodie memoirs and novels, the easier it is to find them. I do exactly what you suggested–keep a running list of great quotes as I come across them. Sometimes I fit them into the chapters as I go along, but always I choose a quote for each chapter before I sent the draft to my editor. BOLO Books: At the end of your books, you include recipes for dishes that are mentioned throughout the books. Where do your recipes come from and have you tried them all? Lucy Burdette: Most of them come from me, except for a few that I’ve borrowed from friends–with their permission. For example, the recipe for chocolate bars with chocolate ganache frosting, was loaned to me by my good friend Pat Kerens. I had mentioned that my deadline was fast approaching and I hadn’t had time to experiment with ganache. She not only offered to let me borrow her family’s recipe, she made a batch of them for my husband and me to sample! The strawberry whipped cream pie with chocolate graham cracker crust is fashioned after a similar dessert we enjoyed at Seven Fish restaurant. All in all, I’ve become a much better cook in the course of writing this series! BOLO Books: The youth homeless “shelter,” Project Lighthouse, plays a role in the plot of Murder with Ganache. Is this based on any real organization that exists in the Key West area? Lucy Burdette: There is a real place called Project Lighthouse in Key West–I visited several times while I was writing to talk with the director, Jai Somers, and some of the kids at the center. It’s set up as a drop-in day center for homeless kids, serving as a safe place off the streets, and offering services from basic showers and laundry facilities to help with finding jobs and contacting family. I admire the work they do with a vulnerable population. Of course the teen characters in the book are strictly fictional. 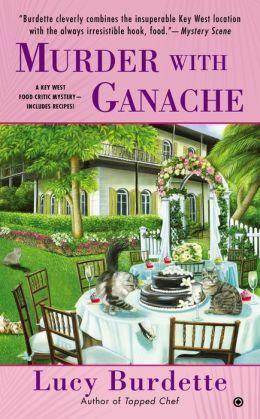 BOLO Books: In Murder with Ganache, Hayley is assigned to write an article about the Hemingway cats. I have no doubt that you had to do a fair bit of research on them and was wondering if there was anything interesting you discovered that you weren’t able to work into the novel? Lucy Burdette: I couldn’t jam in all the details of the cats for fear of slowing down the story. But the Hemingway House is one of my favorite places on the island. Each cat is named after a celebrity or historical figure and they have free range of these spectacular grounds. The names are based as much as possible on their personalities. So for example, Howard Hughes hangs out in the basement and Ernest Hemingway loves the ladies! BOLO Books: You are one of the wonderful authors who make up the Jungle Red Writers blog. As a huge fan of Jungle Red, I know why I love to visit every day (clue: it’s the stimulating discussions and the lovely personalities of both the authors and the commenters), but I would love to hear what you find so special about the blog? Lucy Burdette: These writers are my dear friends–so generous and supportive as we find our way through the difficult business of writing and publishing. They are the first people I turn to if something goes very wrong–or very right. But just as important are the gang of interesting folks who come to read the blog every day and participate in the comments. It’s a wonderful, vibrant community and I feel lucky to be part of it. 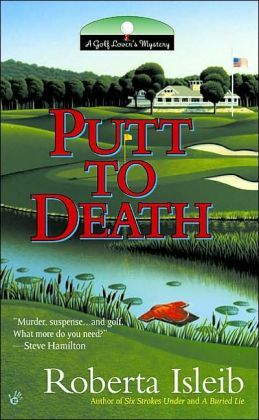 BOLO Books: Under your real name, Roberta Isleib, you wrote a successful series of golf themed mysteries. Do you miss writing those? And do you still find time to golf? Lucy Burdette: Funny you should ask! My golfer character was an aspiring professional named Cassie Burdette. I loved writing about her adventures and her growth as a person and a golfer. A reader wondered why she couldn’t have a bit part in the Key West series–and I thought, why not? So in my fifth book, Season’s Grievings, she’s visiting Key West, and in fact is Hayley’s cousin. So much fun to throw them together and watch the sparks fly! I still play golf, but not nearly as often as I did ten years ago. BOLO Books: Now is the inevitable question of what is next? What kind of trouble is Hayley going to find herself in next year? Thanks so much for allowing me to visit your blog–and for your support of books and writers! BOLO Books: It was my pleasure, Lucy. And I hope that my followers will check out your books. Couldn’t help posting to FB with this comment: “This interview whet my appetite for these books.” Yes, it was fun to pun, but I do truly love the atmosphere created by the interview. It definitely makes Burdette’s work even more tantalizing. I’m also intrigued by the collision of hobby (golf, cooking) and profession. Tempts me to start a mystery series about a couch-to-5Ker! Thanks for spreading the word about the interview Cy. These Key West mysteries are perfect for beating the winter blues. And I have to say, many of the recipes sounds delicious. Hi Kristopher–great interview. I love your questions. Thanks for stopping by Lisa. I completely agree, A trip to Key West certainly sounds nice right about now. Road trip? In a few years, Bouchercon will be in Florida, so maybe that will be a chance to add on a bit of a side trip. 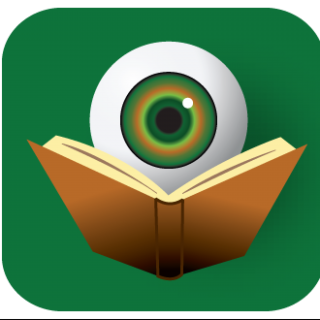 thanks for reading Cy–I do enjoy combining my passions with my mysteries. What you describe sounds like an excellent character arc! And thank you Lisa–I remember that pie very well from Jungle Red Writers. 2018, doesn’t that sound like a long ways away? I guess it isn’t really. I like St. Pete so count me in:). and thanks again for having me over today! As for 2018, I am definitely in for that Bouchercon as well. It has a great planning committee, so I know it is going to be a good one. It is still a long way away, but time is flying so fast it will be here before we know it.